Durability and beauty are unlikely partners. It is rare when both are exclusive when specifying vertical surfaces. Even rarer still is the challenge for design professionals to use solid surface textures in a variety of vertical applications. From elevator cab interiors to wall protection, finding unique surfacing solutions can be a challenge. Many of these wall finishes are designed for residential use only and will not perform well in commercial spaces. With solid surface the design opportunities are endless. Public spaces demand durable surfaces. High performance surfaces should not be plain or unattractive. They should perform beautifully. Many vertical surfacing solutions in the marketplace today are focused only on aesthetics. Performance is usually an afterthought. Few surfacing products today combine both aesthetics and durability in one vertical solution. Solid surface can be thermoformed with textured patterns and CNC machined in a variety of custom patterns. Painted MDF or molded plaster can not offer the same value. In response, ASST created SCULPTCOR ® textured wall surfaces to provide an attractive durable solution unlike anything on the market today. Manufactured with 100% solid surface acrylic, this is an antibacterial wall cladding that is made to last. ASST’s proprietary mounting system allows for field adjustment and individual panel removal for maintenance. It is ASST’s legacy to continue assisting design professionals with project challenges other fabricators avoid. Be sure to contact us with your next solid surface project! First impressions always count! 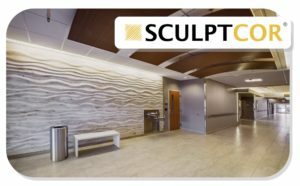 Be sure to call us for your next SCULPTCOR® project! Whatever you need, ASST can build it to your exact specifications, in a safe manner, and to the quality standards you expect. Contact us now online or call us at 717-630-1251. Building Owners with high traffic corridors had only a few choices for durable wall protection solutions in the early years before solid surface. Design Professionals were limited to recommending materials such as vinyl wallcovering, marble, granite, concrete and plastic laminate. The shortcomings of these materials were many ranging from cracking and delaminating to requiring total replacement when damaged. It was not until the late 1990’s that vertical solid surface wall cladding started to become popular. ASST and other leading fabricators and manufacturers helped to push applications beyond the horizontal countertop. 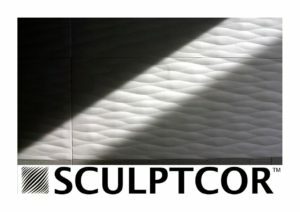 ASST created SCULPTCOR® Textured Surfaces in the early 2000’s to provide better design solutions for interior as well as exterior cladding. Architects and Interior Designers have helped to continue to push applications. Technological advances in CNC machining and thermoforming have also helped solid surface wall cladding move to more mainstream applications such as airports and other high traffic public spaces. 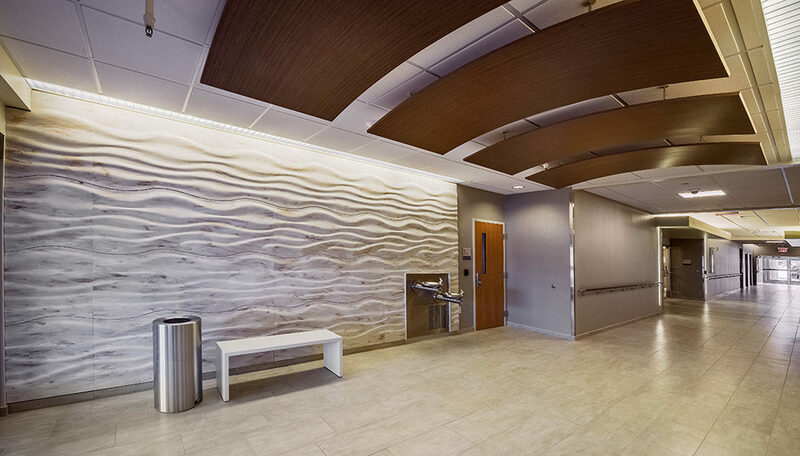 Today, solid surface wall cladding is widely utilized by Design Professionals across a variety of end user markets from K-12 and Collegiate Education to Corporate Space and Healthcare environments. ASST is uniquely positioned to fulfill all aspects of your project. Whatever you need, ASST can build it to the exact specifications you require in a safe manner and to the finest quality standards you expect. We look forward to Going Beyond™ to address your exciting project challenges. Contact us now online or call us at 717-630-1251. Today, healthcare designers have “raised the bar” with regards to design. The use of textured solid surface for wall protection is becoming a popular choice with many health systems. More hospitable than hospital. Controlling the spread of infectious disease with solid surface countertops has become the standard in healthcare. Vertical textured solid surface applications are also a smart way to incorporate a unique aesthetic that is durable, attractive and easy to maintain. The installation of textured solid surface panels can be challenging. Mounting alignments for patterns can be difficult, especially around corners. The reverse textured sides of panels do not have a level surface to mount against a wall. To solve these issues we created a proprietary solid surface “leveling puck” and mounted z-clip system which allows for precise adjustments in the field. Panel patterns are able to be aligned with ease and installed according to architect specifications.